What was your initial reaction reading these few paragraphs? What did it tell you about the person who wrote it? How does the prologue set the tone for the story that follows? Talk about the title. What does "The Death of Bees" signify? What were your first impressions of Marnie and Nelly? Would you call them typical fifteen- and twelve-year-old adolescents? Compare them with other children, both those you may know as well as the girls' classmates and friends. Did your impressions of the sisters change over the course of the novel? Contrast Marnie and Nelly. How do they see themselves, each other, and the world around them? What accounts for the things they see differently? How would each fare without the other? Marnie explains that Nelly is "just not like other people and can't fake it, which is more than can be said about me. I've been faking it my whole life." Why does she believe this about herself? How is Marnie faking it? How do their parents' deaths affect the girls? Is Marnie right to keep their deaths a secret? Why does she do this? Are her instincts about adults and the system correct? Think about their parents, Gene and Izzy. What kind of parents—and people—were they? Do you think they loved their daughters? If so, why did they behave as they did? What did the girls learn about life from them? How much was Izzy's background influential in who she was as an adult? Why are Marnie and Nelly so different from their parents? If it were possible, do you think we should have laws determining who can have children and who cannot? Why do some people have children when they cannot or do not want to take care of them? How might the girls be different if they had been born to different parents? What role does class play in the story? Several of Marnie's friends come from more privileged backgrounds. What are they and their parents like? How does class often blind us to reality? Describe Lennie and his role in the girls' lives. How has his past shaped his life? What draws him to Marnie and Nelly? Why does he notice them and why does he care? What about the girls' other neighbors—why don't they care? Is Lennie a good paternal figure, and if so, why? What does he give the girls that Izzy and Gene did not? What do the girls think about Lennie? Why do they trust him? Why does the fact that he cares for them scare Marnie? What role does Vlad play in Marnie's life? Describe their relationship. What do they offer each other? What do you think of Vlad? Is he a good person?We hear about Vlad before we meet him. How does what we first learn about him color our impressions? What happens when Robert T. Macdonald appears? What is his relationship to the girls? What does he want from them? Why are both Marnie and Lennie suspicious of Robert? Has he really changed, as he professes? The novel is told from the viewpoints of three characters: Marnie, Nelly, and Lennie. Why do you think the author chose this form of narration? How does it add to the unfolding story? How might it be different if it had been told from one of the three viewpoints? Would you say the book had a happy ending? What do you think will happen to the girls in the future? What about Robert and Vlad? What drew you to read (or suggest) The Death of Bees? Did it meet your expectations? Were the characters and the situation believable? Did you have a favorite character, and if so, why? 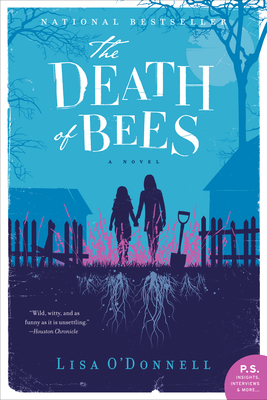 What did you take away from reading The Death of Bees? Read "Secrets Buried in the Yard: A Story of Sisters, Survival, and Salvation" by Reading Group Choices' Neely Kennedy for discussible topics and themes!